H&H Reeds Printers are not only printing specialists, they are also provide a variety of services in the signage and exhibition markets. 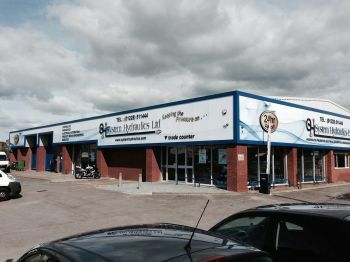 Within their UK facility, they have the capacity to design, fabricate and print their signage. Fabricator Steven Robinson shared some of their recent projects using 3A’s Dibond aluminum composite. The Harrison & Hetherington Dairy Expo is one of the biggest in the UK. Maurice Oliver and Steven Robinson of H&H Signs were commissioned to replace the expo’s outdated interior signage. They chose Dibond as their substrate, knowing that the signs would be used for future expos; the material was chosen for its durability over time. According to Robinson, there were seven large sheets of Dibond fabricated into sign trays. 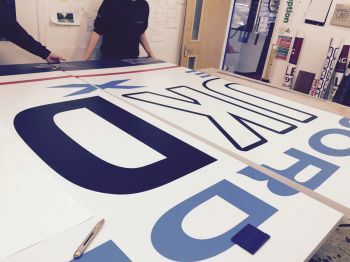 They were put together and applied with vinyl to create an 8-meter long sign. Additionally, a photographic backdrop was created but with full color print applied. H&H’s long-time customer, System Hydraulics, approached the company for their new exterior signage after their business expansion. The company had recently wrapped several vans for System Hydraulics, so the owner wanted brand consistency in the design of the new signage. 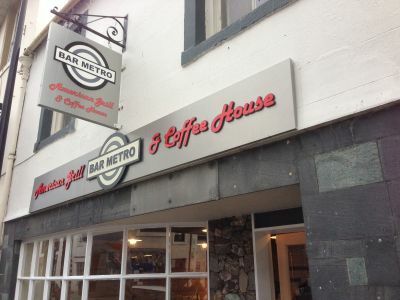 The designers did a great job of creating an exterior sign that not only achieved the retro-inspired look, but stands out in an area where cafes/bars are quite saturated. A special thanks to our friends at H&H Sign and Display Division for sharing their Dibond ACM projects.